Mark Waid knows comics. From his career in comic press writing for Amazing Heroes to becoming an editor at DC to acclaimed writer with notable runs on The Flash, Daredevil, The Fantastic Four, Captain America and The Justice League of America and the mini-series Kingdom Come and Superman: Birthright to Editor-in-Chief, and later, Chief Creative Office of publisher of Boom! Studios to the founder of digital comics site Thrillbent and now retailer as co-owner of Alter Ego Comics in Muncie, Indiana, there might not be a more qualified person to discuss the comics industry. Next week, his newest project, Shadow Walk in collaboration marks not only his first work with Legendary Comics (with collaborators Max Brooks and Shane Davis) but also his longest single piece of work in his career. 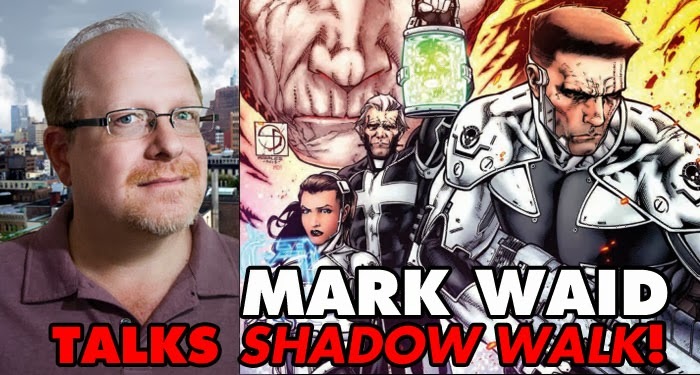 Mark took some time out of his busy schedule to chat with us about Shadow Walk, the state of the industry and how missing Batman every Thursday informed his work on this book. FOG! : How did you get involved in the project? Mark Waid: Bob Schreck reached out to me because I’ve known him forever as an editor, and we’ve been looking at something to do together. Thomas Tull, the studio head of Legendary, the big man, had pitched out to him, the basic nugget of the story Bob reached out to people who wanted to build off that basic elevator pitch. I thought that it was an interesting opportunity and before we finished having lunch, I had been inadvertently filling the story in my head. So, I was intrigued. Then, sitting down with Thomas in a subsequent meeting, I hadn’t officially signed on yet, and I was personally ready to walk out the door with his handshake and go, “Listen, I appreciate the meeting, but this sounds like a movie pitch. You guys should get a movie guy.” Instead, what really amazed me about it was that Thomas sat down with me, very humble; he wasn’t pompous and didn’t act like a studio head. He sat down as one guy telling the story to another guy, and we went back and forth with it. Nobody asked me to like a movie treatment disguised as comic, nobody to ask me to write a TV pitch disguised as a graphic novel. The edict was tell the story in a medium that you are most loyal with and make it work in that medium. 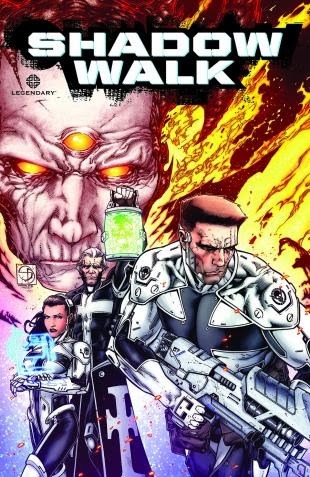 How is Max Brooks involved with the storytelling aspect of it? From my perspective, Max did so much of the heavy lifting it’s insane. Max is whip smart and incredibly well-read. Not only did we talk in general terms about the story and the characters, but on a specific level Max then went off and did a story bible for the graphic novel that really wasn’t about the story. It was about the back story. He went back and looked at the valley of the Shadow of Death as it has appeared not only in the Bible but in other cultures and other milieus in other mythologies over the years and sort of knit it together into this big document, and gave it life. If this thing really did exist, how would it have manifested to the ancient Babylonians? How would it have manifested to the ancient Greeks? How did it manifest before Judeo-Christian time? Building off that, my god, what a springboard to go from. As a longtime fan of your work, one of the interesting things about Shadow Walk, was that this was actually the longest original piece of our work of yours that I’ve read as a single volume (as opposed to a collection of issues) Did this affect your approach as a writer at all? Yeah, this is the very first time I’ve ever written the words “Page 112” on top of a script page because everything up to this point has been collected as a graphic novel written as installments. So, this was the first time I was able to get in there and just have the breathing room to go nuts, and Legendary backed me one thousand percent. When we first started talking about this thing, we talked in rough terms about a 100-page graphic novel, give or take, but the edict hey said all along was, “Take as many pages as you need to tell the story.” We ended up with 124, 125, something like that. Finally, I just had to stop writing so we could get this thing off to print, but the idea that you don’t have to hit page 20 on a cliffhanger every single month, instead letting the story breathe a little more organically and let the scenes take the space they need to take without worrying about splash pages and where 2 page spreads fall and where the cliffhangers are and “continued next issue” – it made the story more enjoyable to write. There were some quiet moments, which I really appreciated, like when they sat around and were just talking at the base camp. Usually in something like this, which is such an intense story, you don’t have those quiet moments. It was a nice, refreshing moment of place. Thanks, another example is we don’t really get to the valley until page 30 or so, which, if we were doing the traditional comic series, that would be halfway through issue 2. If I was doing a book called Shadow Walk and it was a monthly ongoing, and we weren’t “shadow walking” by the end of the first issue, I’d be losing my mind. I’d feel like, “The pacing is all off.” So, like I said, having that ability to write like that changed everything in the best possible way. The book handles something that, really, comics in general doesn’t handle that often, which is religion. You present it with several, very different points-of-view, but without any opinion or judgement. Are you personally religious, and/or was this part of your goal in terms of developing the characters to represent every different point-of-view or at least several points of view? They were supposed to represent different points-of-view not to be politically correct or balanced or anything but just because that’s the nature of drama. You should put characters together who have different goals and different motivations and watch them create sparks as they bounce off each other. On a personal level, I’m not a religiously spiritual man, but it’s baked in my DNA. I was raised in the Deep South and we went to Thursday evening tent revivals and revival meetings, which , by the way, is probably why I’m not a religious man because as a kid, I had to watch snake handlers on Thursday nights but also because, growing up Thursday night I always knew I’d miss the second half of Batman. So, I’m still getting over that 50 years later. So, the power of Judeo-Christian mythology and the power of what is written in the Bible, whether I grew up using it as a spiritual foundation or not, isn’t really the point. The point is that it really is baked into me into a pliable, emotional level. So, that is why it’s so attractive for me to go back in there to look at it from the point-of-view of a grown-up rather than a scared little kid. Are there plans to continue Shadow Walk as another graphic novel, or is it just a one-off and see where it goes? Well, it depends. We designed it as a one-off, but we’ll see how it’s received. You’ve had a very long career in different aspects of the industry, but the past several years, you’ve gone from being a writer to running a comic company to becoming both an advocate and publisher of digital to, now, retailer yourself. Having seen so many aspects of the modern industry, where do you see its greatest strengths and weaknesses in today’s market? That’s a real good question. The strengths are much different than I thought they would be. If you’d ask me the same question three or four years ago, I would have predicted that the retail market would have collapsed by now; that it would have all gone digital just because print sales had been eroding for such a long time and print costs have continued to rise. But whether it’s because comics are now a more culturally accepted medium in the world; where the geeks won and now we get to rule the the Earth, or that just because there’s so much good material coming out there. The medium both in print and in digital is healthy and I think that a big part of that is now that the material is available both in digital and in print makes it easier for the medium itself to survive because there’s no secret I’ve harangued with the print distribution system with the fact that there are entire states in the United States that aren’t served by a decent comics store. You’ve been in the industry for over 20 years. What is your take on comic book icons becoming nothing more than intellectual properties? Do you think that longtime audiences are now more responsive to new titles and characters than they once were? Yeah, absolutely. Absolutely because there’s only so many times you can watch Dr. Octopus and Spider Man fight. There’s nothing wrong with that, there should always be comics of Dr. Octopus fighting Spider Man because there’s always something there for new readers. I think the longtime readers or older readers are eager to absorb what the independent companies are doing whether Boom! or Legendary or IDW, that’s where they find material with the older voice to it, the real author’s voice to it as opposed to the worst case scenarios, creators just servicing the copyrights. You’re both a fan favorite and critically acclaimed writer in the industry. After having worked in the industry for as long as you have, what still excites you about the comic medium as a way to tell stories? There’s still room for my voice. It’s still a place where one or two or three guys or a writer, an artist or two, and maybe an editor, they come together and create a story that has integrity on it’s own. It doesn’t have to be vetted by a bunch of television studio heads or marketing guys or sales reps, and you don’t have to answer to everybody. Frankly, what’s exciting about comics is that it’s not a very expensive thing to do, and that means they’re just not wasting millions of dollars on any project. You get a little more artistic freedom. It’s great. MARK WAID Takes On THE GREEN HORNET AND KATO! First Look - ARCHIE #1 Comic Superstars MARK WAID and FIONA STAPLES Reimagine an Icon!